A developer’s guide to the features and performance metrics of Solace technologies. Solace PubSub+ is a powerful message broker that runs on any computer in a virtual machine or a container. Solace PubSub+ Cloud is a managed messaging as a service (MaaS) offering that lets developers easily tap into the power of Solace PubSub+ without installing, maintaining or upgrading messaging software. Solace PubSub+ appliances route messages entirely in hardware for unparalleled capacity, performance and robustness, with the low TCO of a turnkey appliance. Solace PubSub+ offers unmatched capacity, performance, robustness and TCO so our customers can focus on seizing business opportunities instead of building and maintaining complex data distribution infrastructure. Solace PubSub+ message brokers—set up as any combination of software, hardware or cloud—give you an enterprise-grade digital backbone because they support the key features listed below. The goal of this page is to quickly introduce developers to these features so you can use them to create great applications. Solace PubSub+ lets you pick the clouds that are right for you with the flexibility to change your strategy as technologies and markets develop. You can freely share data between workloads across clouds and your legacy solutions. Scaling and protocol bridging are handled by the messaging layer, instead of your code — all while avoiding lock-in through the use of open standard protocols and open APIs. Learn more about how PubSub+ enables hybrid cloud strategies, or drill down to learn how we support each of these cloud environments and technologies. Solace PubSub+ message brokers support many different transports and protocols making them ideal data distribution platforms providing a ‘one stop shop’ for all your messaging middleware needs. Solace Messaging APIs provide robust, uniform client access to Solace’s capabilities and qualities of service. Solace Enterprise APIs generally support the following common features. Where support for one of these features differs for a specific API it is noted in the page describing the specific API. Solace facilitates integration with applications, other middleware and data movement technology with support for open APIs like JMS and OpenMAMA, and open wireline protocols such as MQTT and REST. Solace PubSub+ supports two modes of message delivery: Direct (non-persistent) and Guaranteed (persistent). They also support session based transactions and XA transactions, as explained here. The Solace PubSub+ messaging APIs for C and Java RTO support Inter-Process Communications (IPC) so applications co-residing on a host can communicate directly with each other. This is typically done to achieve ultra-low latency communications or reduce the bandwidth used by the applications on both the host and the message broker. Learn more here. Solace PubSub+ offers easy integration with commercial and open source technologies including app servers, ESBs and more. Based on the open source Apache Camel framework, HybridEdge lets you easily integrate your existing application infrastructure — ESBs, JMS brokers, database connectors, etc. — with PubSub+ using Camel connectors. For microservices whose data sharing needs are mostly request/reply interactions best handled with RESTful HTTP, PubSub+ lets applications send and receive messages using native HTTP client libraries instead of any messaging client libraries. Solace PubSub+ comes with comprehensive authentication, authorization and encryption functionality to ensure that your infrastructure and information are protected at all times, and that you pass internal and regulatory security audits. Solace PubSub+ supports several different ways of authenticating client applications and administrators. Applications and administrators alike can authenticate with username/password, and Solace supports integration with one-time password (OTP) systems. Both applications and administrators can also be authenticated through integration with LDAP, Radius, Kerberos or an internal database. There are a number of ways to restrict and grant the ability of applications and administrators to perform tasks. Application authorization can be managed with access control lists (ACLs) that define which IP addresses each application can connect from, and what topics they can publish or subscribe to. These ACLs can be statically configured against usernames on the appliance, or assigned based on the LDAP group membership of the users. The Subscription Manager capability is useful for centralizing subscription management in a Message VPN, that is, centralizing which clients or services get which subscriptions in the Message VPN. Applications can use the Solace On-Behalf-Of subscription feature which enables one (special) client to manage subscriptions on behalf of other clients within a Message VPN. Administrative roles control what each admin can see or modify across the message broker and within each Message VPN, and secure logs record every configuration change complete with the date, time and specific user who made the change. To ensure that messages and administrative traffic can only be read by intended recipients or administrators, Solace PubSub+ supports transport-layer TLS encryption using a variety of cypher suites. Solace PubSub+ message brokers are the most robust messaging middleware technology available today, offering slow consumer control, fault tolerance, high availability and disaster recovery without the need for 3rd party products. Solace PubSub+ message brokers can operate in high-availability (HA) redundant pairs for fault tolerance. Solace high-availability provides 1:1 broker pairing to increase overall service availability. For more information see: Redundancy and Fault Tolerance. Solace PubSub+ offers provides disaster recovery (DR) functionality without the use of complex external mechanisms like storage replication, mirror gateways or plugins. Solace PubSub+ can automatically replicate messages and message delivery state from message brokers in the active datacenter to message brokers in the DR site. Messages can be replicated either synchronously or asynchronously. SolacePubSub+ can also also propagate all configuration changes from the active datacenter brokers to the DR site brokers so you don’t have to coordinate or port over configuration changes among the brokers. This ensures that the solution is both simple and robust to operate and high performance. For more information see: Data Center Replication. Solace PubSub+ doesn’t let slow consumers impact the performance of publishers and fast consumers. For guaranteed messaging, publishers and fast consumers are identified and prioritized over slow or recovering consumers even as message storage to slow consumers continues to increase. Solace PubSub+ message brokers can be configured with a few clicks to form an intelligent, self-routing event mesh that automatically distributes events and information between any number of globally distributed applications and devices as if they were connected to a single broker, what Solace calls dynamic message routing. Dynamic message routing makes it easy to increase the capacity or footprint of your infrastructure (in terms of geographic reach or hybrid cloud deployment) through the addition and clustering of more PubSub+ message brokers. An inter-broker bridge is called a message VPN bridge. Message VPN bridges provide inter-connection between two Solace Message VPNs. These message VPNs can be on separate Solace PubSub+ message brokers running in separate data centers, within a single datacenter, or even within the same broker. Bridging messages between two Solace message VPNs allows applications that exist in entirely separate message domains to communicate. Messages are attracted to a Message VPN using topic subscriptions which provides administrators with fine grained control over what messages are bridged. Message VPN bridges support both Direct and Guaranteed messaging. Solace PubSub+ appliances can route up to 24 million messages per second for Direct messaging, and up to 1.6 million messages per second for guaranteed messaging. Up to 40 Gbps in and out of the appliance is supported for both guaranteed and direct messaging. Solace PubSub+ appliances maintain low, predictable latency even at high messages rates, and set new standards for low, consistent latency across all qualities of services. For direct messaging, average latency is as low as 18 microseconds from sender API to receiver API, and for guaranteed messaging Solace PubSub+ appliances offers a range of performance options that let you achieve latency as low as 25 microseconds API-to-API. Solace’s message caching solution, called SolCache, enables the storage of data sent as part of a high-performance messaging stream in memory for low latency retrieval of data. Access to this message caching capability is integrated into the Solace API, enabling sophisticated lookups and operation. Scalability: SolCache can be distributed across servers to scale as your rates and topic space grows without affecting applications using the cache. Overlap handling: SolCache lets developers determine how to deal with data that arrives while a cache request is outstanding. The live data can fulfill the cache request, be delivered to the application after the cache response, or be delivered to the application immediately followed by the cache response when it arrives. Global Caching: When a client application requests a cached entry for an object from its local SolCache and this object is published from a remote location and not currently cached by the local SolCache, the local SolCache will automatically retrieve it from the remote SolCache and cache it, along with its updates locally, to service subsequent client requests. Incremental Updates: SolCache supports user plug-ins which allow messages to be interpreted before applying them to images stored in SolCache. For example, if a feed handler sends out delta updates to a security or book, a SolCache user plug-ins could process them and do something like overwrite the last bid or ask fields, or keep a cumulative value for trade volume. 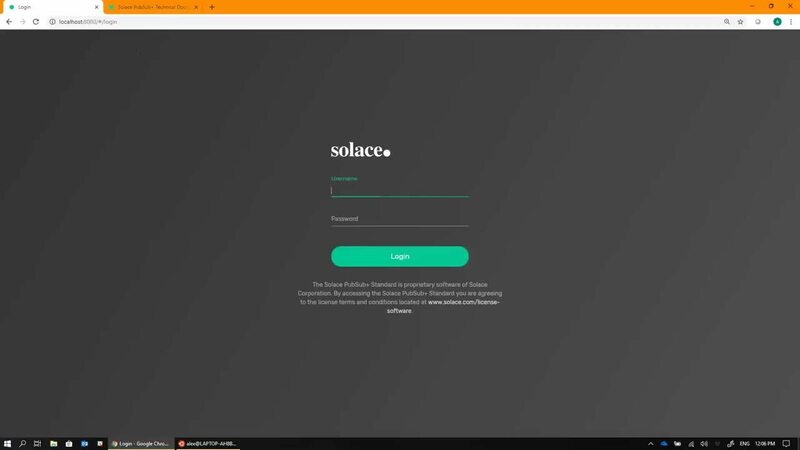 Solace PubSub+ supports message replay so clients can request and receive information hours, days or even weeks after it was sent and delivered. Message replay makes it easy to recover from crashes and subscription misconfigurations by letting applications retrieve messages they missed. Message replay also lets you more safely and smoothly deploy applications into production by subscribing them to legacy messages as a test before exposing them to the live message stream. Solace’s message replay functionality can be configured on a per-application basis, and is accessible via all Solace APIs and supported protocols like AMQP, JMS, MQTT, REST and WebSocket. Solace PubSub+ Manager is a browser-based administration console packaged with the Solace PubSub+ message broker. It’s a next generation UI for configuring, viewing, and troubleshooting your message broker. Solace PubSub+ Monitor collects and reports critical broker metrics and events so you can detect issues before they impact end-users. Monitor also sends alerts based on pre-configured thresholds and status events to help operations teams proactively address developing issues and optimize system performance. SolAdmin: SolAdmin provides a simplified graphical interface for managing Solace message broker properties that is designed to meet the needs of both advanced administrators and administrators inexperienced with Solace message brokers. SEMP: Solace Element Management Protocol version 2 is a RESTful API that you can use to configure Solace message brokers. It complements the Solace CLI and SolAdmin thick client GUI and provides a programmatic way to apply configurations to Solace message brokers. SYSLOG: SYSLOG standards for receiving asynchronous events including messaging events such as clients connecting/disconnecting, queue threshold reached, disk threshold reached and many, many more rich events. Applications can use any Solace messaging API to subscribe to and receive these asynchronous events over the messaging system by subscribing to topics for the events of interest. Solace PubSub+ supports the ability to virtualize application groups within a single broker with complete message isolation through the message VPN feature which is explained here. All Solace PubSub+ message brokers have integrated WAN optimization such as parallel TCP connections, streaming compression that typically yields 80% payload compression, control over buffer levels and TCP parameters like slow start and congestion management within the range of what Linux’s TCP stack allows. Want a deeper glimpse into PubSub+ throughput?